I’ve been living in Los Angeles for almost a year and a half now, but there are still some differences between California and the Midwest that catch me by surprise, like the types of produce grown in backyards. In Minnesota, my coworkers would bring in homegrown zucchini and tomatoes to share. Here, my coworkers bring meyer lemons, clementines, and figs from their backyards! Last week I was thrilled to see almost a dozen homegrown pomegranates at my office, free for the taking. I couldn’t even tell you what a pomegranate tree looks like, but I sure do love this tart and juicy fruit. Instead of pumpkins and crunchy leaves, pomegranates are now the signal that lets me know fall is here. This salad is bright, vibrant, and refreshing, perfect for those warmer-than-usual fall days that seem to abound in September. The hardest part is seeding the pomegranate, which isn’t too difficult if you cut it like this and then pull out the seeds in a bowl of water. Extracting the seeds under water lets the pith rise to the top so you can scoop it away, and it also reduces the likelihood that you’ll squirt your clothing with pomegranate juice, which stains like crazy! I hope you’re all having a marvelous September! Make the dressing: Whisk together all dressing ingredients. Taste and add more salt and pepper if desired. Set aside. Prepare the salad: Use a serrated knife to slice the lettuce into bite-sized pieces. Rinse and dry. Toast the almonds by placing them in a small skillet over medium-low heat. Watch the almonds like a hawk and cook, stirring occasionally, until lightly golden brown and fragrant. (This should just take a few minutes.) Set aside to let cool. Assemble the salad: Place the lettuce in a large bowl. Add dressing to taste and toss. Sprinkle almonds and pomegranate seeds on top. Summer is in full swing around here, as evidenced by my sunburned shoulders (ouch), and I’m trying to enjoy as many summery things as possible before Labor Day. Cookouts, lake trips, outdoor movies, beach days, you name it. Everything is more fun when you’re outside. That includes eating, of course. Summer food is usually so simple, yet so rewarding. Hamburgers (or veggie burgers), sweet corn, watermelon, anything and everything on the grill. I love when it’s so warm all the time that I actually find myself craving salad! This BLT panzanella is a fun and hearty summer salad that would be a great addition to a picnic, but it can also be a main course on its own. It’s basically a deconstructed BLT in salad form, and it’s on heavy rotation in my meal-planning schedule. Whenever I’m lucky enough to have fresh avocados on hand, I’ll chop one up and throw it on top. Hardboiled eggs are a great addition too. I hope everyone had a happy and safe holiday weekend! Summer is fleeting, so soak it up while you can! Preheat oven to 425° F. Melt the butter in a large microwave-safe bowl. Add the cubed baguette and toss to coat. Sprinkle with salt and pepper to taste. (My go-to spice blend for croutons is Penzey’s sandwich sprinkle, but plain old salt and pepper works just fine.) Transfer the croutons to a rimmed baking sheet lined with parchment paper or foil. Bake for about 10 minutes, tossing halfway through, until evenly browned and crunchy. Set aside to cool. Meanwhile, place the bacon in a large nonstick frying pan or griddle and place over medium-low heat. Cook, turning occasionally, until bacon is browned and crisp. Transfer to a paper-towel-lined plate and let cool. To make the dressing: In a small bowl, whisk together yogurt, buttermilk, garlic, and lemon juice. Stir in salt and pepper to taste. 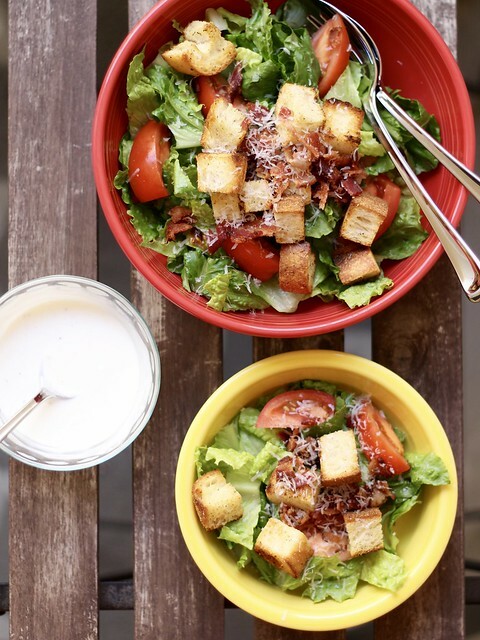 To assemble the salad, toss together romaine, tomatoes, croutons, bacon, and parmesan cheese. Serve with dressing on the side. Oh kale. You poor thing. First, you were a modest dietary staple. Then people kind of forgot about you because food scientists started inventing magical food like cheese puffs. But wait! You rose from obscurity to become obscenely trendy. Of course, your hipsterific popularity made it inevitable that you would eventually become a punchline. Now that we got that history lesson out of the way, here’s yet another kale recipe. I know. Bear with me. The problem is that I get kale delivered practically every week nowadays, so I have to come up with interesting ways to eat it. Being a native midwesterner, I turned my latest bunch of kale into a hotdish, minus the tater tots and tuna-noodles. First I cooked the kale with onions, garlic, and butternut squash until the veggies were soft. Then I tossed in some cooked wild rice and stirred in a creamy homemade cheese sauce, using gruyere and comté because I’m fancy like that. I also had parsley from my CSA box so I added that to the breadcrumb topping. 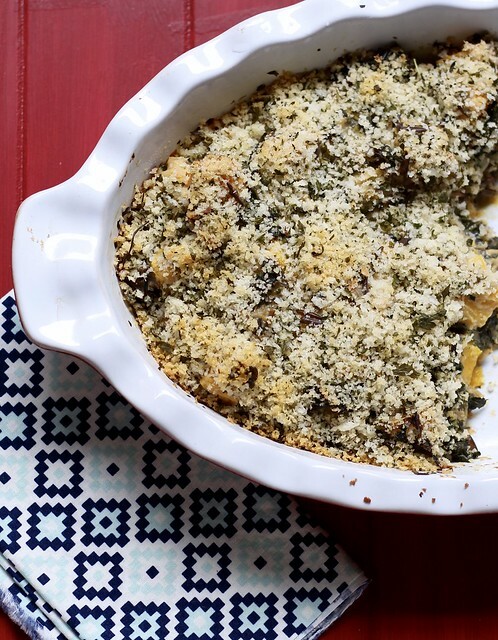 As it emerged from the oven, the final dish was a cheesy, nutty, indulgent yet vegetable-packed meal that let me conquer one more week’s worth of kale. Victory was mine! Until next time. Heat oven to 400° F. Butter a 2-quart casserole dish and set aside. Heat 2 Tbs. olive oil in a dutch oven over medium heat. Add the onion, squash, garlic, and kale, and sauté until vegetables are tender, about 15-20 minutes. Remove from heat and stir in the wild rice. Meanwhile, melt butter in a 2-quart sauce pan over medium heat. Add flour and stir for about 1-2 minutes, until it’s a light golden color and forms a thick paste. Slowly whisk in milk and keep stirring until the mixture thickens slightly. Remove from heat and whisk in gruyere and comté until melted. Stir in 3/4 tsp. kosher salt and a few grinds of black pepper. Pour the cheese sauce over the vegetable/rice mixture and stir until evenly coated. Taste the mixture and add additional salt and pepper if desired. Transfer mixture to the prepared casserole dish. Bake at 400° F for 20-25 minutes, or until mixture is bubbling and the top is golden brown. Source: A Lingonberry Jam original, inspired by The Well-Cooked Life and Smitten Kitchen. I suppose it only makes sense to follow a cookie recipe with a salad recipe. Or rather a salad dressing recipe. You guys have already seen a couple of recipes on this blog from America’s Test Kitchen’s “The Complete Vegetarian Cookbook.” It has quickly become one of my absolute favorite cookbooks as well as my chief partner in meal planning. Each week, we get a box of local produce delivered by our CSA. (All winter long! Pinch me!) After sorting through the offerings, I usually flip to the index of this cookbook and decide what meals I want to make for the week. I almost always receive some sort of heirloom lettuce, which gets to be tiresome week after week. So I’ve been working my way through various salad dressing recipes. 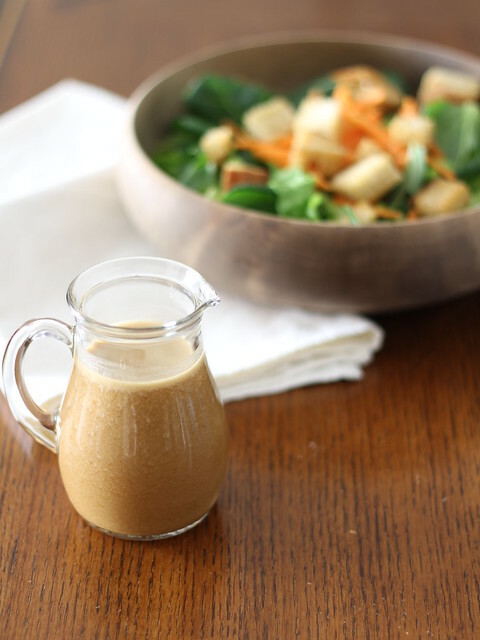 This miso-sesame dressing has emerged as a favorite so far. It’s savory and salty and garlicky and gingery, and I had to hold myself back from eating it by the spoonful because that’s embarrassing, right? Given the flavor profile, this dressing goes well with Asian-inspired salad ingredients. I tossed it with a mixture of butter lettuce and tatsoi, carrots, edamame, green onions, and some homemade sesame-crusted croutons. And then I ate it pretty much every day for a week. So good. Place water, vinegar, miso, soy sauce, honey, ginger, and garlic in a blender and blend until the mixture is well combined, about 15 seconds. Add oils and blend until the oils are incorporated and the dressing is smooth, about 15 seconds. Dressing can be made ahead and refrigerated for up to 1 week. * I couldn’t find miso paste at my regular grocery store, so I ordered it online. There are several different types of miso paste so make sure you get the red one; it has a much deeper flavor. Don’t worry if it comes in a large container; the stuff lasts forever in the fridge. Plus, you can always make miso brown rice cakes! I was eighteen and a college freshman the first time I ever tried a veggie burger. My college cafeteria served them every day in the “grill” line, right next to the hotdogs and hamburgers. Some of my more worldly friends ate them quite frequently, even though they weren’t vegetarians. So I decided to try one. It was… meh. Pretty dry and limp, and strangely crunchy and uniform in shape. The cafeteria made a lot of things from scratch, but I’m pretty sure those veggie burgers came straight out of a box. They were decidedly underwhelming. 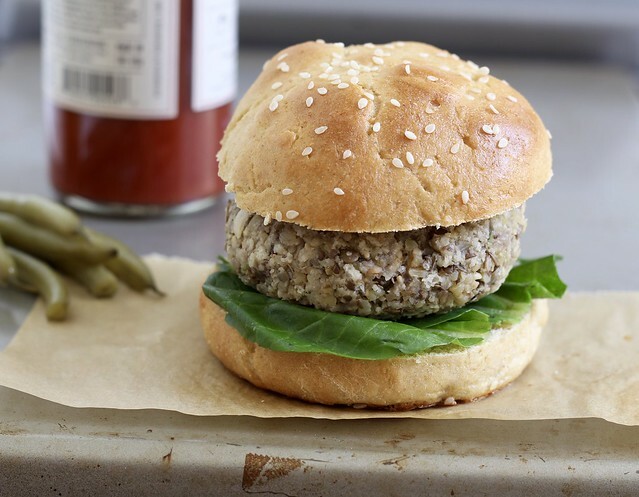 Here’s the thing: a veggie burger should never be compared to a real beef hamburger. That’s just not fair. But it should be something that deliciously stands on its own, satisfying both meat eaters and vegetarians alike. I made these veggie burgers for the first time last night and they were a big hit. They’re savory but don’t taste exclusively like mushrooms. The flavor sort of reminds me of wild rice. The recipe has a lot of steps, but the batch makes 12 so you can freeze some for later. Serve them with traditional (or avant-garde) burger toppings, and if you’re feeling really ambitious, you can even make homemade buns. And yes, this might be sacrilegious, but I’m totally thinking of putting bacon on top. Shhhh. In a medium saucepan, bring lentils, 1 tsp. salt, and 3 cups of water to a boil over medium heat. Reduce heat to medium-low and simmer for about 25 minutes, stirring occasionally, until lentils become soft and fall apart. Drain thoroughly and spread on a rimmed baking sheet lined with paper towels. Lightly pat dry. Meanwhile, heat 2 Tbs. olive oil in a large skillet over medium heat until shimmering. Add mushrooms and cook for about 8-10 minutes, stirring occasionally, until they have released their liquid and softened. Add onions, celery, leek, and garlic, and cook, stirring occasionally, for about 10-15 minutes, until the vegetables have softened and are beginning to brown. Spread the cooked vegetables on top of the lentils on the baking sheet and let cool to room temperature, about 20 minutes. Combine 2 cups water, bulgur, and 1/4 tsp. salt in large bowl and microwave (covered) for five minutes. Drain the bulgur in a fine mesh strainer and use a spatula to press out any additional water. Return the bulgur to the bowl and set aside. Grind cashews in a food processor until they’re finely ground, about 25 pulses. Add the cashews, lentils, vegetables, and mayonnaise to the bowl with the bulgur. Stir until evenly combined. Working in batches, grind the bulgur mixture in the food processor until it is coarsely ground and evenly textured. (This takes about 15 pulses per batch.) Transfer the ground mixture into a separate large bowl as you work. When all the mixture has been processed, stir in panko and 1 tsp. salt. Taste and add additional salt and pepper as desired. Scoop up about 1/2 cup of the mixture and pack it into a tight, 1/2-inch thick patty with your hands. Repeat with remaining mixture until you have 12 patties. Heat remaining 2 Tbs. olive oil over medium heat in a large skillet until shimmering. Place four patties in the pan and cook until well browned, about 4 minutes. Flip and cook the other sides until they’re also browned, about 2-4 minutes. Repeat with remaining patties, and serve. To make ahead, you can freeze the shaped but uncooked patties on a parchment-lined baking sheet until solid. Stack the frozen patties between squares of parchment and store them in a ziplock bag in the freezer. When you’re ready to eat them, sear the frozen patties until brown (see above) and then bake them for 10 minutes in a 350° F oven until warmed through. * While 2 cups of panko worked just fine, I think next time I’ll try using 1 1/2 cups. If you try this before I do, let me know how it works! As much as I love all this holiday food, it’s nice to sneak in some healthier options for everyday meals. These brown rice bowls have quickly become a favorite in my household. Even though they feature simple brown rice (duh) and roasted vegetables, they are totally crave-worthy. The nutty, chewy rice contrasts with a zingy vinaigrette, and soft roasted carrots are complemented by shatteringly crisp kale. Adding a fried egg on top takes it to the next level, as the runny yolk becomes a lovely, rich sauce all on its own. Are you hungry yet? The only tricky part of this recipe might be tracking down the za’atar, which is a tangy Middle Eastern spice mixture of sesame seeds, sumac, salt, and dried herbs. You can find it at Penzeys or other spice stores. I promise it’s worth it, but if you really can’t find za’atar (or really can’t stand the idea of one more shopping trip) the carrots should be fine with just a sprinkle of dried thyme instead. Enjoy! Preheat oven to 375° F with the racks in the upper- and middle-thirds of the oven. Combine boiling water, brown rice, and 3/4 tsp. salt in an 8-inch square baking dish and cover tightly with foil. Bake on the lower rack until rice is tender, about 45-50 minutes. Remove from oven, fluff with a fork, and let stand for five minutes, covered with a dish towel. Meanwhile, line a rimmed baking sheet with foil. On the baking sheet, toss carrots, 1 Tbs. olive oil, za’atar, 1/4 tsp. salt, and 1/8 tsp. black pepper. Spread carrots out evenly on the sheet and cover tightly with another piece of foil. Bake on the upper oven rack for 20 minutes. While carrots are roasting, toss kale with 1 Tbs. oil, 1/4 tsp. salt, and 1/8 tsp. black pepper in a bowl. When the carrots have finished roasting for 20 minutes, remove the foil and spread the kale evenly on top of the carrots. Return the baking sheet to the oven, uncovered, and roast the vegetables for 15-20 minutes, or until the kale is crispy. To make the vinaigrette, whisk together vinegar, shallot, and 3 Tbs. oil in a small bowl. Season with salt and pepper to taste. Evenly divide the rice into four bowls. Top the rice with roasted vegetables and drizzle each portion with a tablespoon or so of the vinaigrette. Cover the bowls to keep them warm while you fry the eggs. Crack the eggs into a small bowl and sprinkle with salt and pepper. Heat 1 tsp. olive oil in a 12-inch skillet over medium-high heat until it shimmers. Carefully slide the eggs into the skillet, cover, and cook until your desired doneness is reached, about 2-4 minutes. 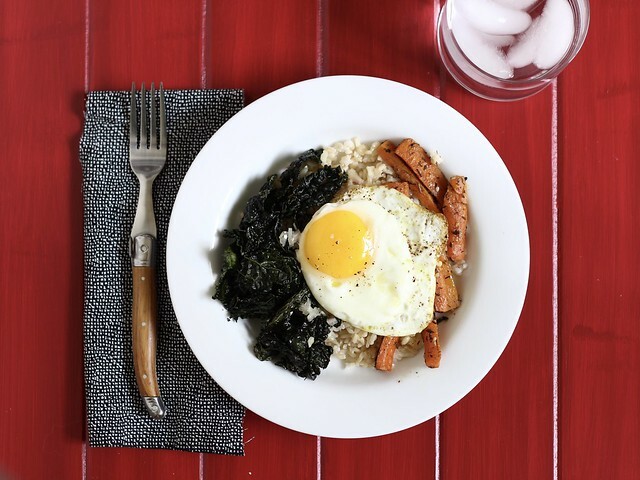 Top each rice bowl with a fried egg, and serve. The calendar says it’s fall, but I’m quickly realizing that plays out a lot differently in Southern California. Growing up in Minnesota, I was always sad to see fall arrive. Sure, September and October brought a few gorgeous weeks of shockingly bright maple trees, fresh apple cider, and haunted corn mazes, but they flew by way too quickly. I was always sad to put away my summery dresses and haul out the scarves. Oh how quickly things have changed. I understand this is the equivalent of complaining about first world problems, but this is the first year I’ve lived in LA and I miss fall! Don’t get me wrong, I’m thrilled to live in a place that doesn’t have winter, but could we dial down the regional thermostat juuuuust a little bit please? I’m very confused by 80° temps alongside pumpkin spice lattes, and I’m sick and tired of my summer clothes. Okay, I promise I’m done now. And instead of complaining too much, I’ve been bringing autumn into my life through food. I’ve been busy making things like butternut squash soup, pumpkin gnocchi, and homemade candy corn. I made refrigerator pickles, and then I canned 2 1/2 pounds of green beans as if fresh veggies would never be in season again. After that, I covered the apartment with mini gourds. Autumn has arrived! Another seasonally-inspired dish I whipped up recently was this delicious kale salad. It’s strikingly beautiful (can you say that about a salad?) with autumnal colors of deep green, purple, and orange. Candied pecans and roasted sweet potatoes nicely offset the bitterness of the radicchio, and the tangy pomegranate vinaigrette makes the whole dish crave-worthy. (Note: if your grocery store doesn’t carry pomegranate molasses you can easily find it online.) No matter what fall looks like in your part of the country, I suggest you make this salad soon! Preheat oven to 400° F. On a foil-lined baking sheet, toss sweet potatoes with olive oil and sprinkle with salt and pepper. Bake until lightly browned, about 20-25 minutes, flipping halfway through. Remove from oven and set aside. Meanwhile, place kale in a large bowl and massage it for about a minute, squeezing with your hands until the leaves slightly wilt and soften. Don’t be afraid to be rough with it; the kale needs help to become nice and tender. Set aside. 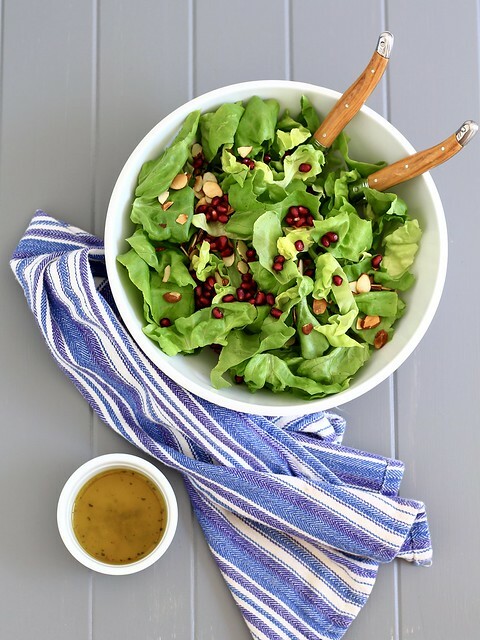 Make the vinaigrette: In a small bowl, whisk together water, pomegranate molasses, honey, vinegar, mustard, shallot, salt, and pepper. Whisk in olive oil, taste the dressing, and add more salt or pepper if desired. 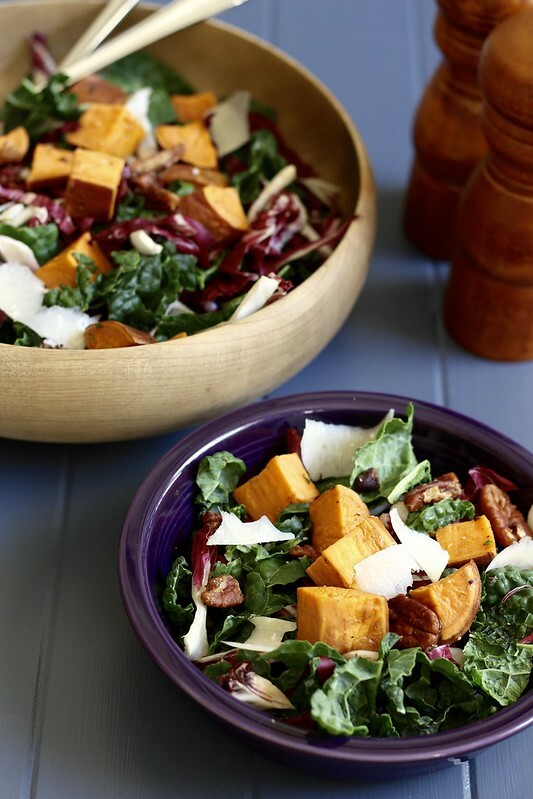 Add radicchio and sweet potatoes to the bowl with the kale and toss until combined. Add dressing to taste and toss until the salad is evenly coated. Top with candied pecans and shaved parmesan, and serve.